Note that the following games are listed in no particular order since they're all quite fun to play. So if you love dealing with expenses, selling goods and giving loans in a board game scenario, then you're going to absolutely love the coming paragraphs! This one's a pretty straightforward money board game that revolves around trading, bidding, card drafting and dice rolling. It's somewhat similar to the legendary Monopoly in the sense that players can buy/sell a property and give/take loans. Another similarity is that Pay Day has been around for ages as well - since 1975 to be more precise. Gameplay-wise, players engage in a 31-day month scenario where they have to pay for numerous expenses and bills. Also, every player receives the same salary at the end of each month and they have to cover all expenses with their salary (if not, loans are available too). Eventually, the player with the biggest pile of money wins after several months (decided by the players). Of course, this list simply can't do without the addition of the legendary economy board game called Monopoly. It was officially released in 1933 and ever since millions of people have enjoyed it. The primary concept behind Monopoly is to build your real estate empire and dominate all others. The core mechanisms of this game primarily involve rolling a dice, bidding, trading and even player elimination. In terms of gameplay, all players start with the same amount of money (classic rules) and they start buying property. In a nutshell, players gain money when other players visit a property that belongs to them. On the other hand, players lose cash when they find themselves on someone else's property, although there are cards that can penalize you in terms of various taxes and fines. And in the end, the winner is the last person to have any money left. In comparison to Pay Day and Monopoly, this one's definitely a tad more complex, hence the recommended age. Brass is a money board game that takes you back in time to the town of Lancashire, at the peak of the industrial revolution. Thus, 2-4 players start competing in the battle for collecting cotton, iron and coal. The main theme and gameplay mechanisms here revolve around manufacturing, transportation and route building. It all starts by building your industry til and rail (or canal) and then you move onto properly develop your industry so that you may dominate all others. And as the rounds go by players collect something known as Victory Points as they're gathered by the rails, industry tiles and canals that you've built. Eventually, the player with the highest number of VPs takes the victory home! There are plenty of awesome money board games out there that anyone who likes this board game genre will certainly enjoy. 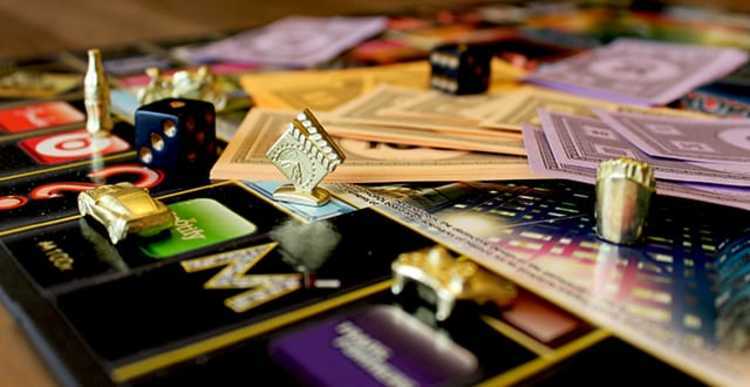 However, games like Monopoly, Pay Day and Brass are undoubtedly one of the most fun ones and we're sure that you're going to have a blast playing them. But what if you'd like to try out some cutting-edge, modern and unique online casino games? Well, then your best bet would be to head over to Spigo's extensive portfolio of premium online games. From football fans to party animals and typical casino lovers, we've got what you're looking for!